The Crawford Family: Three Years Old! We had our 3 year well check today! It was so different than the ones before. She wore a little gown, (isn't it so cute?!?) instead of running around in a diaper like at 2 years! She had a hearing and vision screening. I don't know why, but I thought it was SO cute when she held her little hand up listening to the beep in her ear. She is just such a big girl! I could tell she was quite nervous the whole way to the office, she was very aware where we were going. And, of course, the office was moving to an electronic charting system today, so we had to wait a LONG time. But, she did so good. When Dr. Terk came in, she greeted him by saying, "Hi, Dr. Terk. 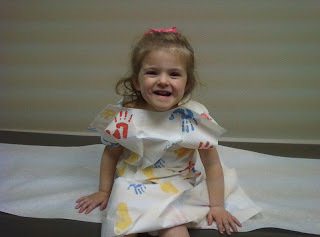 My mommy said that you are a pediatrician." I think just to make sure he was really who he (and I) said he was! He got a kick out of that. She did well through the exam, as long as I was right there beside her. When he asked her to climb up on the exam table, she told him that I was going to stand right beside her. She weighs 31 lbs and is 36 inches tall, a whole yard stick!!! That puts her between the 50-75th percentile for both her height and weight. Dr. Terk said that she was "just great!" Addie girl, you are such a blessing to us. I can't believe that it has been three whole years since you made your grand entrance into the world. But I know one thing, you have not stopped spinning, twirling, or even almost slowed down. You are such a strong, intelligent little girl and you definitely keep mommy and daddy on our toes! I pray that as you grow into a little lady, our bond grows stronger and stronger. We pray that God grabs ahold of your little heart, as I know he has started to stir questions in there already at your young age. We pray for your future husband that right now, he is being nurtured, loved, and at this early age, already seeing what it means to be a man of God. It has been neat over the last couple of months to see you and your brother start to really enjoy each other. He loves you so much, and you are already such a good big sister. Thank you for the joy that you bring us, and the way that you challenge us everyday. We love you more than words can express. Happy 3rd Birthday Sweet Addie! So precious!! I have to stop reading your blog at school cause I look like a crazy lady crying at my computer! Kiss that little birthday girl for me!! Love you! And that is why I do what I do. Seriously Taber, she is so darling! I could just squeeze her. I'm so glad she is growing just perfectly! What a blessing! I'm so glad you are not taking anything or any moment for granted. It warms my heart to think about your sweet little family. Miss you! Oh and Happy Birthday Addie!!! Looks like she loves being 3 already!